Many New York City parents and children are very concerned about children getting well-rounded educations. Some children instead of training in various sports or running home to homework and video games are getting arts-educations after school. It is fortunate for us that those who want to follow in the footsteps of off-Broadway and Hollywood actors, actresses, singers, dancers, playwrights can go to the dramatic theatre arts programming on 1368 Fulton Street and perform at the historic Billie Holiday Theatre in the footsteps of (to name a few) Samuel L. Jackson, Debbie Allen, and Samm-Art Williams. The Restoration Plaza is also the headquarters of Bedford Stuyvesant Restoration Corporation’s Youth Arts Academy and it is an ‘old-school academy’ in the truest sense! This community-based arts/education programming is under the leadership of Peggy Alston and is a highly-reliable place for “prized” young people to train when their aspiration are to compete rigorously for dramatic and performing arts slots in NYC performing arts high schools, distinguished trade, college and university programs and “real careers” in the technical and performing arts and entertainment industries. 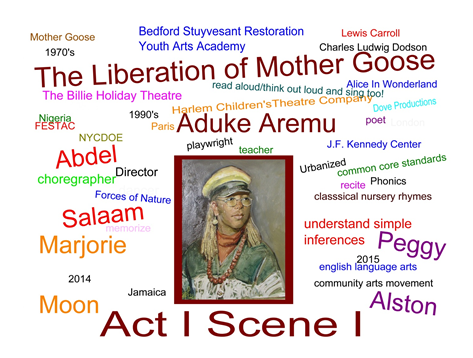 This past weekend (April 5th and 6th) Peggy Alton’s talented kids presented the “Liberation of Mother Goose” children’s play written by author, playwright, educator, Aduke Aremu. 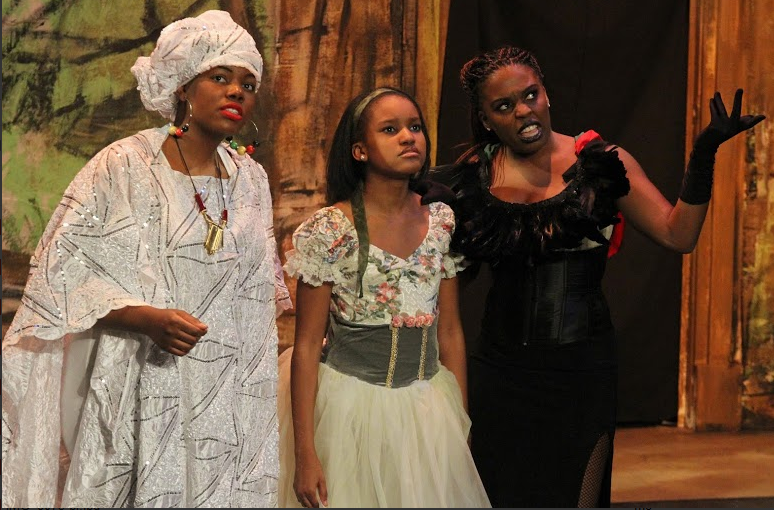 The production was a collaboration of The Bedford Stuyvesant Restoration Corporation Center for Arts & Culture and Dove, LLC. 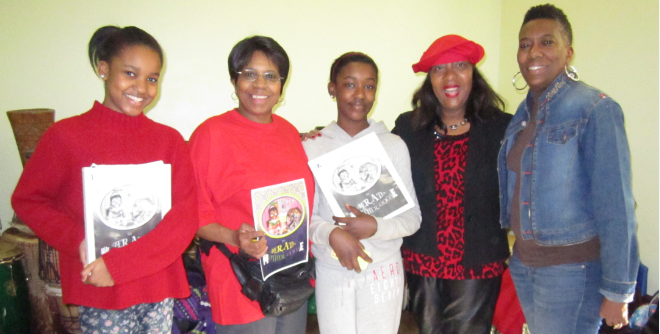 with the 501 ©3 non-for-profit support of the Concerned Women of Brooklyn and a citation from the Office of Brooklyn Borough President, Eric L. Adams. The children’s play featured a visionary director, Abdel Salaam. 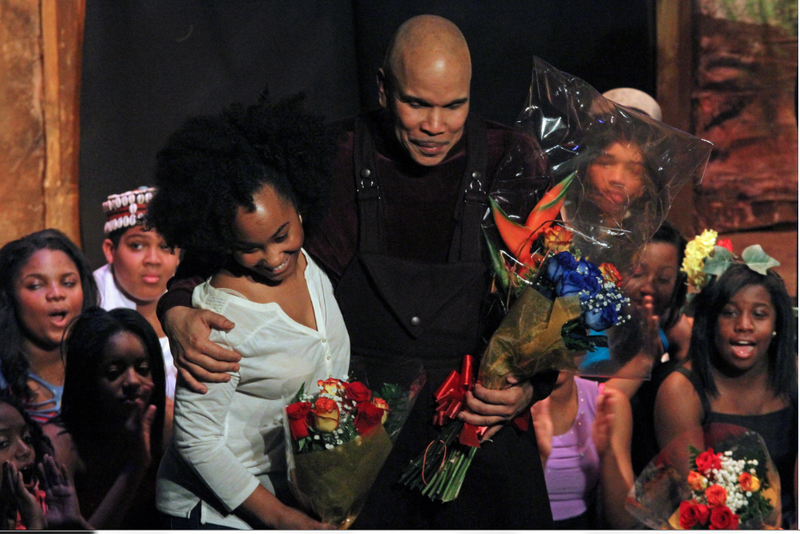 Mr. Salaam is world renowned and a preeminent NYC artistic director. 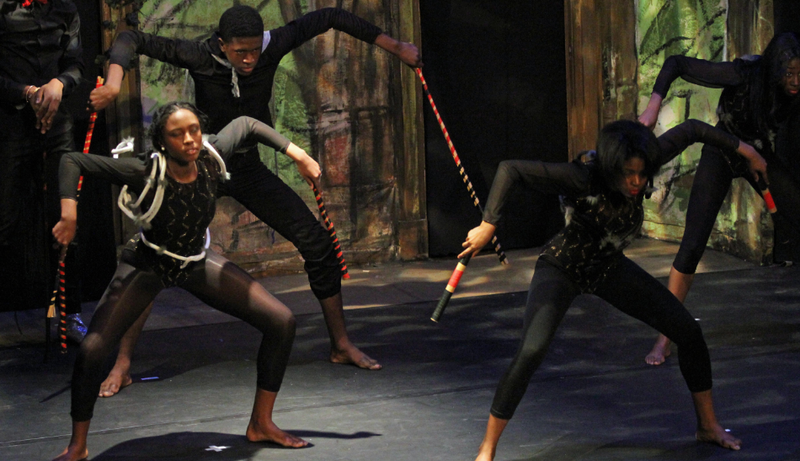 His Harlem-based dance company is called Forces of Nature and he does projects with many community-based organizations including the Harlem Children’s Zone to meet and train tomorrow’s artists and educators. Abdel is well-known for his appetite for excellence. He has the rare ability to authentically tell the stories of the human family with extraordinary cultural and spiritual significance. He is ‘at least’ a local and contemporary — Walt Disney-type-of-mind — when it comes to setting-up fabulous environments which introduce fantasy. 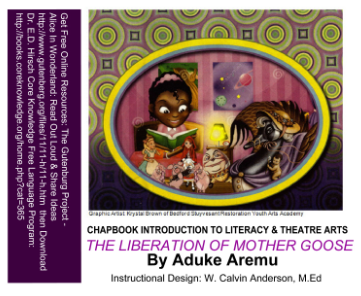 Well ya’ll…this artistic-genius-brother took, Aduke Aremu’s words, muse, humor, fantasy, literacy play and urban adaptation of Lewis Carroll’s bedtime story, Alice In Wonderland and some selected, Mother Goose characters to new and exciting music, dance, cultural and literary heights. And…the Billie Holiday Theatre was packed baby…wall-to-wall for two shows with Tri-state area producers, media, teachers, parents and their children ages 2 to 21 at each show. Charles Dodson and minister and scholar was the author of Alice in Wonderland. He wrote under the name of Lewis Carroll. He created the story in 1863 when asked by three young girls to, “tell them a story”. He did so while he paddled them along the Thames River in Europe one Sunday afternoon. Alice in Wonderland is today part of oral and literary history. It teaches the power of the imagination and the ability of reading to take one out-side of one’s self. Mother Goose is traditionally known to have many authors. It introduces Universal Pre K and elementary school children to reading with a purpose. Students should read the Goose stories out loud to hear the author give voices to strange and funny characters by her use of new sounds and riddles. This is key in education to a “sound and basic understanding of how-to read” and to begin to appreciate sounds in written words or ‘phonic awareness’. 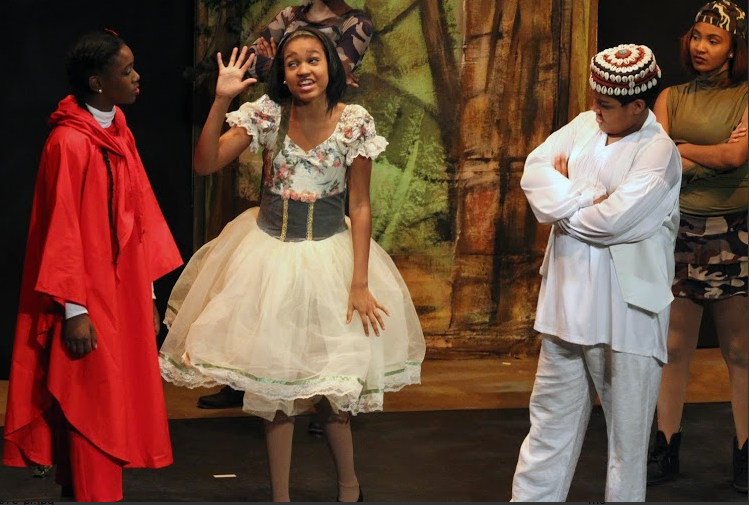 Fully understanding both Alice in Wonderland and Mother Goose are academic credits for Aduke and Abdel because the two works are quintessential tools to introduce primary education and to encourage audiences to delve into continued studies in English Language Arts. The academic wonderland… continues when students later explore courses in exact and near rhyme values, allegory, alliterations, metaphors, symbol, allegory, irony and satire. The classical writers (Lewis Carroll et tal) as critical thinkers are also reviewed to better understand 1) how their works related to their historic eras’ politics, and 2) how we learn to understand the writer’s worldviews as important scholars and artists belonging to the Humanities. The Alice in Wonderland and Mother Goose character metaphors conceptually help us to understand and cope with the fact that human curiosity can get us into trouble and at the very least land us into other worldly realities. The fact that human beings “fall down into rabbit hole- dimensions” is better than some other situation we read about in the papers where people lose their lives. And, seeing “through a looking glass,” at worlds opposite our own realities and expectations helps young people to chose better roads if they have discernment and “out-of-comfort-zone experiences”. A Village Voice writer, Victoria Bekiempis in 2012 explained, “How does the Core Knowledge Method work” using sound and phonics? It helps that kids are introduced to their subject areas outside of the classroom. Bekiemps says, “The basic idea behind the program is that kids learn based upon what they already know. While this seems pretty straightforward, the curriculum generates controversy because it’s rooted in the idea that certain things must be taught to facilitate learning. It also helps them to be…literate… to critically think and to connect thinking and writing…by reading with understanding. Then the greatest literature in the world is appreciated like The Bible’s, Book of Job and other literature like, Edgar Allen Poe’s The Bells; Dr. Martin Luther King Jr.’s Letters From A Birmingham Jail; and contemporary visual arts and scripts like Spike Lee’s movie, School Daze is understood “concepts of alternative realities” is explored and stars were born. Viewing, listening, thinking, writing, reading, and speaking and is very serious business and that is why it has enduring significance to people of every generation whether enslaved, empowered, marginalized or materialized people have to continue to tell the human stories to demonstrate generational freedoms and to contribute to the “world of ideas” and to the finest treasuries of literature! 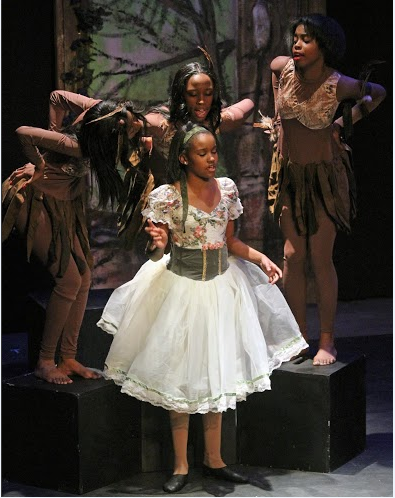 This Alice and this, wonderland came from the personal background of Aduke Aremu. She grew up, Gwen Holmes (aka Aduke Aremu) and attended public schools in Brooklyn graduating from George Wingate High School. Gwen credits her enormous appetite for the arts is due to an early exposure to movies and plays in Manhattan on Sundays after going to church. The story goes…Gwen a bookworm and budding writer met a “fairy godmother” named Vivian Y. Bright (and family) from Berean Baptist Church. Vivian Y. Bright, Berean and members of Zeta Phi Beta supported Gwen in her growth and development from cotillion to supporting Aduke’s her writing and education at Hunter College and NYU. 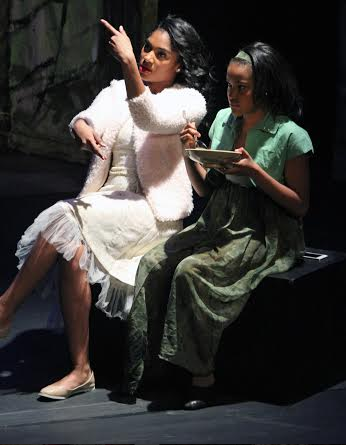 Fairy godmother et tal – “in-the-real” and in rare Brooklyn style… also even financed and encouraged her gifted daughter’s 50-performing kids and company staff in Aremu’s now internationally famous company called the Harlem Children’s Theatre Company sending them to do their things… in Europe, the Caribbean and in Africa. On one of those trips. 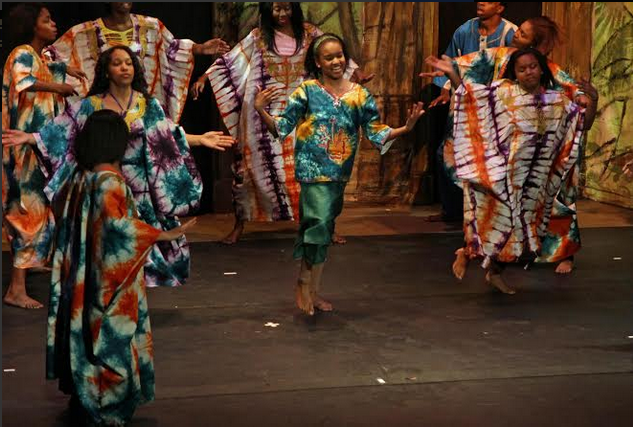 Aduke was given her Nigerian name after her children performed which means “one who is loved by all”. 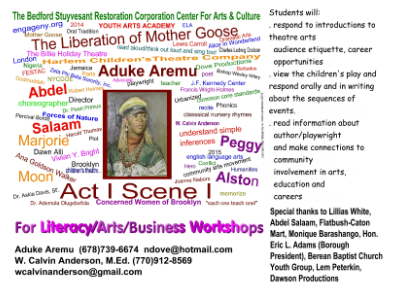 TheBedford Stuyvesant Restoration, the Billie Holiday Theatre and Joseph Papp himself also supported the young female artist, Aduke decades ago. It helped the Brooklyn resident to introduce this work the “Liberation of Mother Goose” and others when the emerging director/producer had gender-politic, difficulties in Manhattan. The artist, educator, Aduke Aremu was also presented to the U.S. Congress in 2010 for commendation by her long-time mentor and friend, Hon. Ed Towns (http://www.gpo.gov/fdsys/pkg/CREC-2010-03-21/html/CREC-2010-03-21-pt1-PgE429-4.htm ). The Bed-stuy performers were from ages 10 to early 20’s. They were led around on stage by a gifted young and very lost hero by the name of Alice (Colby Christina). Colby already a veteran actor, didn’t change sizes and walk through mirrors but did, like Carroll’s Alice search everywhere for her little illusive rabbit. The urban Alice didn’t have to worry about getting beheaded by a mean-spirited queen but she was severely reprimanded by her mom with a Brooklyn/Caribbean/American dialect about DAY-DREAMING in school! Alice this time, dreams us all into new and hilarious “named forests” filled with characters (owls, rabbits, dolls, alcoholics, Mother Goose, FeFe the “BLACK IS BEAUTIFUL” witch, Mother Hubbard, Solomon Grundy, Tweedle Dee and Tweedle Dum, Jill from Jack & Jill, Little Red Riding Hood, The Spider and Lil Miss Muffett, Humpty Dumpty etc.) with messages and personal styles that valued wisdom, humor and the “truth about Mother Goose”! Abdel Salaam director extraordinaire used the entire Restoration Plaza facility from the lobby to the stage to create an environment for the play. The set was like fantasy and the music and drumming (directed by Mario Sprouse) was like a pulse to a modern odyssey with a large measure of endless-character-advice introducing their “own wonderlands”. Nekele Alexis, Jazzlyn Bennett, Deirdre Brock, Sequoia Dorsey-Harris, Shawn Hawkin, Brianna Henry, Hadiya Hyppclite, Mcileek, Joseph, Faith Mondesire, Asyha Mosley, Shoniah Torres, Tianna Smith, Keturab, Stephen, Kiah Dozier, Amira Williams. Dove,LLC.org Executive Committee: Aduke Aremu, Vivian Y. Bright (Chair), Ana Goldson Walker, Dr. Ademola Olugebefola, Peggy Clemons, Bishop Wesley Wiley, Joanne Nabors, Dawn Alli, Dr. Askia Davis Sr., Harold Thomas, Apostle Michelle and Martin Johnson, Monique Barashango, Dr. Kemi Alli,Grace Jones, Cherice Kirkland, Michael Campbell, Peter Moore, Apostle Michelle & Martin Johnson, Deborah Middleton, Cheryl and Wilbert McLaurin. The message of the story is that we all have to know and appreciate our own luring and intriguing personal heritage. It’s like a DNA with sensory attractions if we can hear the calls to our spirits by slowing down the complex voices and distractions in the real and video worlds. The rabbit’s footsteps and ancestral presence is always recognized in our psyches because they meaning our families intended for us to represent them in the ‘cycles of life”. God and the ancestors are forever near. 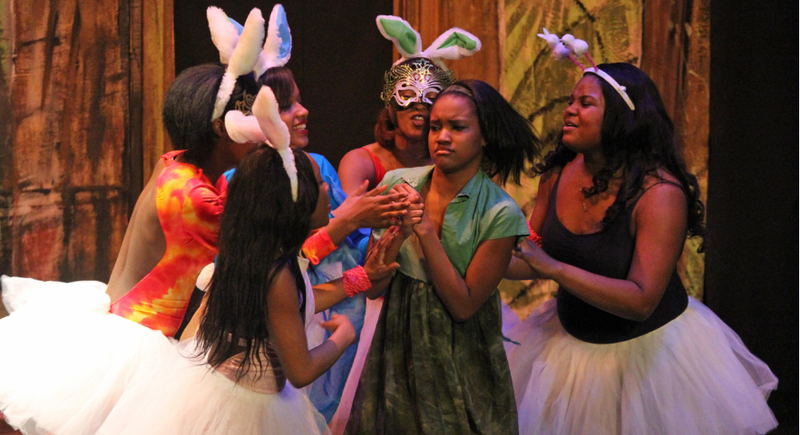 These children grew-up from what we saw in this production. 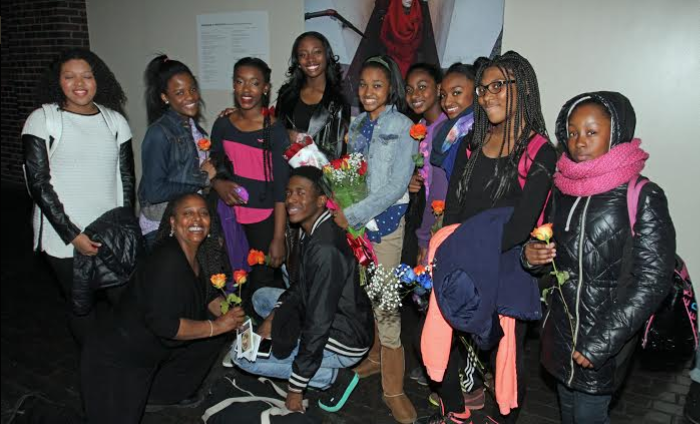 These young maturing artists and performers “owned their craft”. 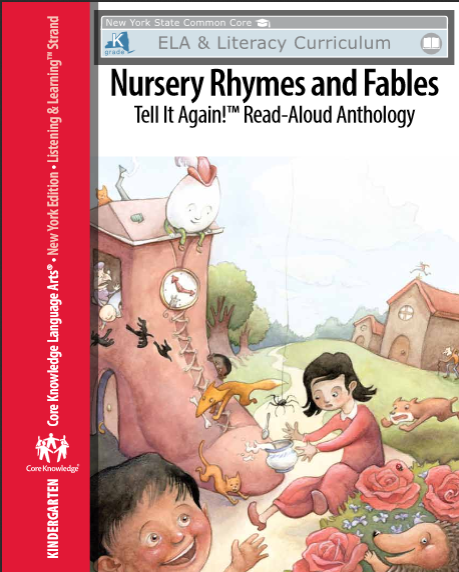 They seamlessly executed their often funny parts and literary lines to the extent that they introduced the two lucky audiences to magnificent acting, singing, dancing and… to visuals and sounds for phonic awareness and creative artistic license. 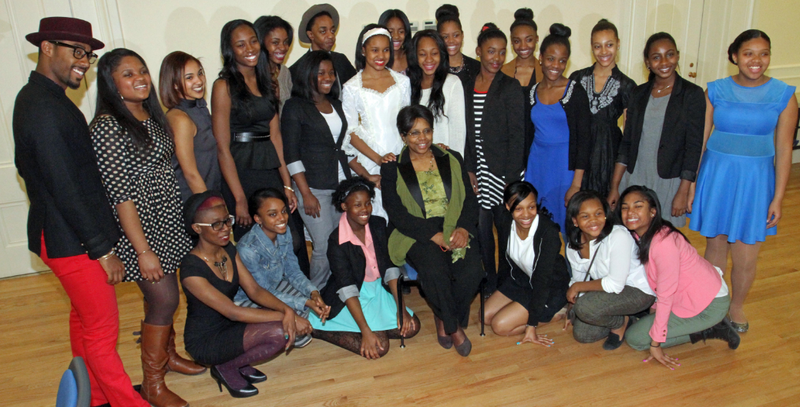 These Youth Arts Academy students were a part of traditional and ‘new’ literature! Part of an English Language Arts experience. 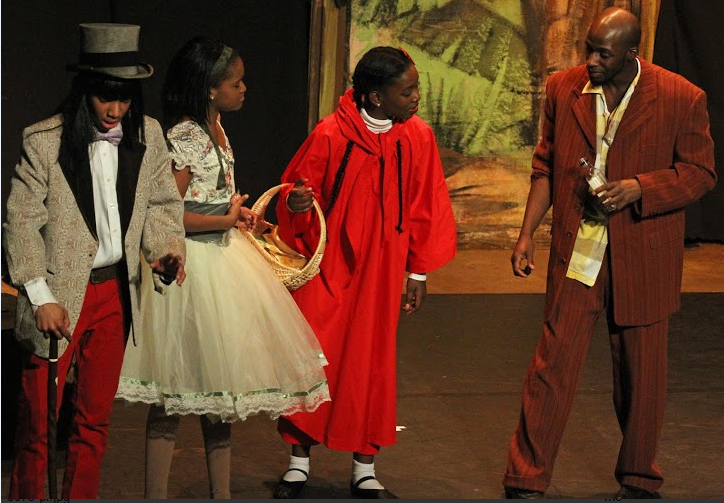 Part of an arts-in-education production that welcomed toddlers, school age children, adults and seniors to a polished and extraordinary entertainment. This play was and is, in and of itself, a curriculum. It presents an adept appreciation for the craft of theatre as it is dedicated to reflective practice of exploring humor, pain, confusion, joy and hope ready in on the surface and in the depths of the human spirit. 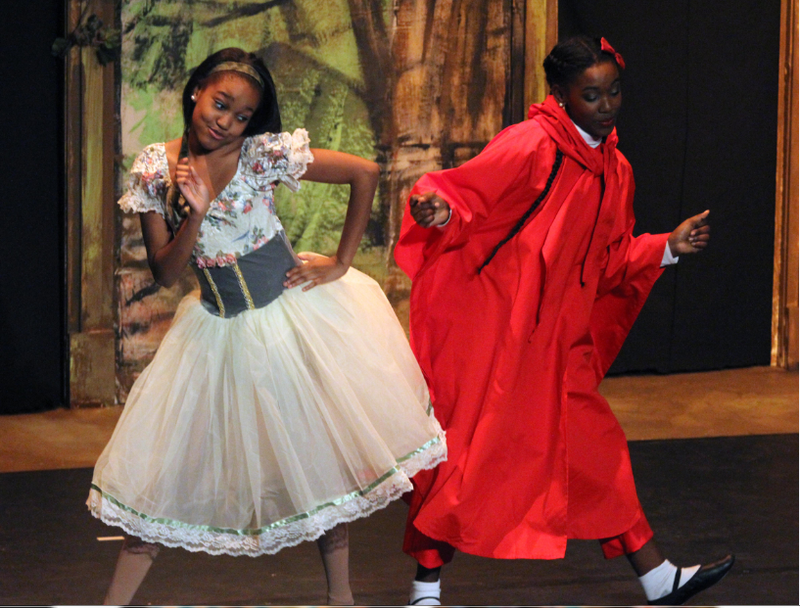 This play has a companion instructional program for schools, after school programs, churches and online partners. The will be televised and will train teachers and junior high school and high school students to mentor younger kids and to get them excited about literature, reading, writing, speaking and listening and acting out their fantasies in productive ways. 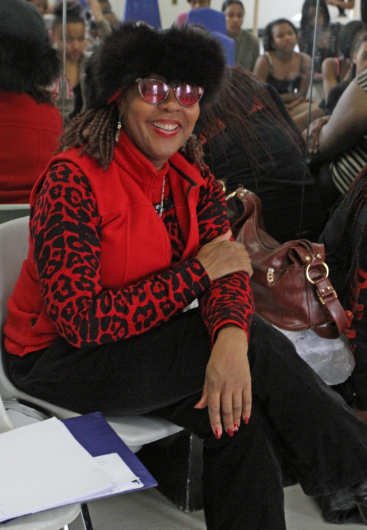 What the audience witnessed was the contributions of master artists, ready-to-learn children, and a community arts organization on-the-same-page with the ‘corporate-heart’ to deliver love, education and excellence. 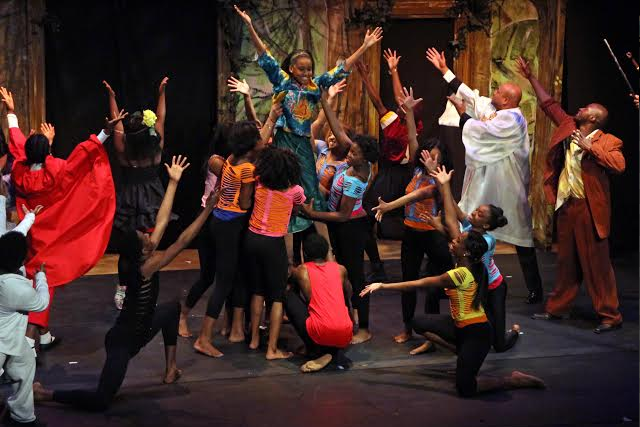 The truth about Mother Goose is… that her timeless love reigns… now in the hearts of NYC children and families too! Thanks Restoration, Dove, LLC, Peggie, Aduke, Abdel, Mario, Lillias and Brian! 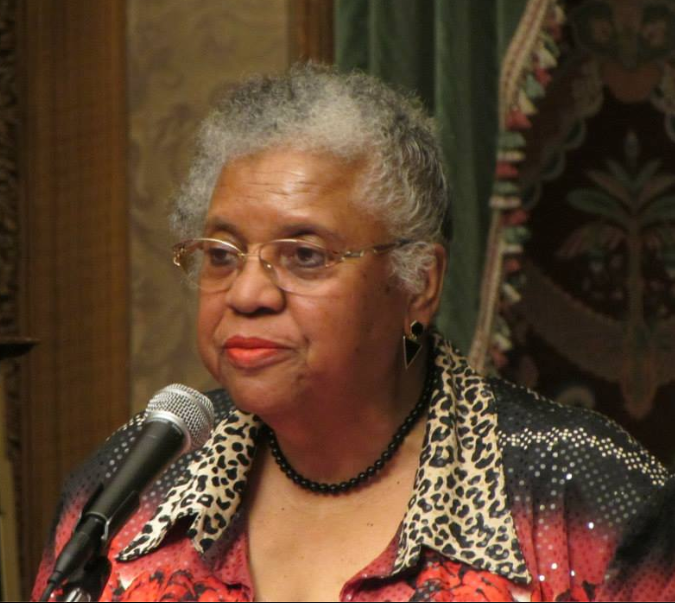 Thank you… mother Francis Wright-Homes, Vivian J. Bright, Berean Baptist Church and Zeta Phi Beta too! 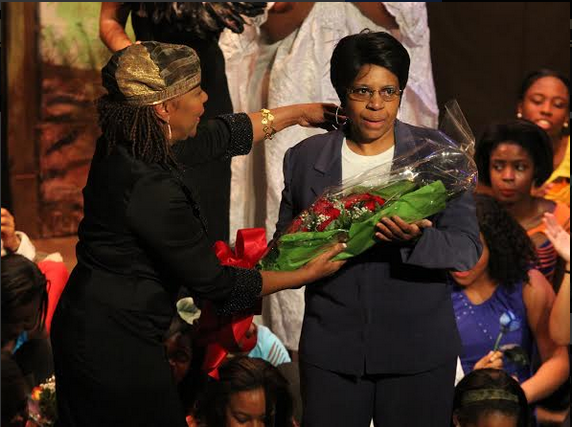 Photos by Lem Peterkin L/R: Joanne Nabors, Vivian Bright, Peggy Alston, Borough President Eric L. Adams, Abdel Salaam, Aduke Aremu, Dr. Ademola Olugbefola, Harold Thomas, Dr. Wesley Wiley, Dr. Askia Davis Jr.
See the little girl in the audience who, “Saw the Rabbit” at 1368 Fulton Street in Bed-Stuy!